Had no trouble getting an early start: my motel room was about 100 yards from the main Union Pacific rail line, on which a train decided to use its air brakes at about 5:00 this morning. Then found myself driving within sight of that same rail line virtually all day long: the Lincoln Highway, I-80 and the railroad all follow the same corridor across Nebraska. Western Nebraska hasn't changed much in a century. Tumbleweeds blow across the road just like in the Westerns, and ranchers in weatherbeaten pickups wave to every oncoming car. Local radio stations run regular "trading post" shows -- nothing but calls from listeners with items they wish to buy or sell. Someone has a more modern sense of humor, though: in Sidney, a motel once known as the Round-Up is now the Generic Motel. However, there aren't many reasons to stop. In North Platte, there's Buffalo Bill Cody's Scout's Rest Ranch, now maintained as a museum, while Grand Island boasts the Stuhr Museum of the Prairie Pioneer. Alas, Nebraska's best tourist-trap museum, Harold Warp's Pioneer Village, lies about 20 minutes south of the route. Both Pioneer Village and the Stuhr Museum raided every attic and moved every loose building within 50 miles for the antique treasures they display, but there the similarity ends. Pioneer Village spent its money on bizarre collections like beer cans and antique outboard motors, while the Stuhr Museum opted for expensive pretentiousness. Its main building was designed by Edward Durell Stone, and looks a lot like Stone's Center for Continuing Education on the University of Chicago campus -- except that the CCE isn't surrounded by an artificial moat and doesn't have a two-story interior atrium with four fountains. The wagons and settlers' artifacts within looked horribly out of place. Outside, a wagon train bound for Sacramento had just arrived. The caravan consisted of six horse-drawn wagons, supported by supply trailers hauling hay and providing more comfortable sleeping arrangements for the wagoneers. They're hoping to reach Sacramento around September 7 -- more than four full months after leaving home. Incredibly, this is only one of three wagon trains currently winding their way west via the back roads. One of the wagonmasters told me that residents of Oregon Trail communities have grown so used to the sight of wagon trains in the summer that they hardly pay attention any more. 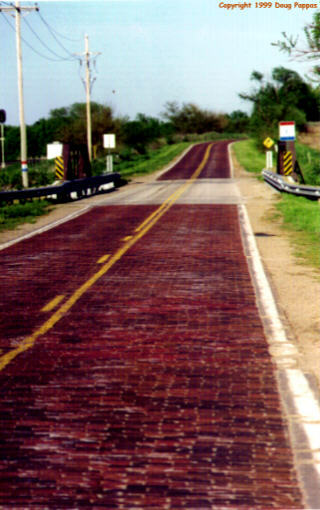 Just west of Omaha, the Lincoln Highway reverts to an earlier form: a two-mile-long stretch of original brick road, dating to 1920. A short drive on this narrow, rough surface left me mightily impressed by the fortitude of the early auto travelers, who drove all day on roads like this, in vehicles with little shock absorption, just to cover 200 miles. Glad I can set a faster pace -- especially with my vacation almost over.